Time to start explaining why Kefka is one of the best villains ever created. His music, his visual representation, his story, everything. Kefka has an extremely short back story as not much is known about it. 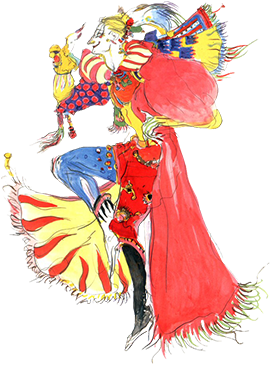 Kefka is the first Magitek Knight (Humans fused with the power of magicite created by the Gestahlian Empire) and because he was the first, the Gestahlian Empire had no control of what they were creating thus turning Kefka into the psychotic power-hungry villain he is. The rest of his story is the entirety of the game, and I will explain his rise to power through the other character’s theme just to leave the best for last. Villains are obviously very essential to a story. They are the main force causing an interest in a story, without them, there is no conflict. So obviously they are very important and it is crucial that they are created well. Presence is one of the key things to a villain especially in film and video games, and the player/watcher/reader needs a reason to hate the villain. Another thing a lot of people like is depth (I happen to be one of those people) in a villain and reason to relate to them. It gives us better understanding of the villain and why someone would want to do the terrible things they do. So how do villains like Kefka the psychotic clown and The Joker (from the Dark Knight Trilogy)…the psychotic clown become some of our most loved villains? Well interestingly enough both of these villains, while not blatantly slapping you across the face with feels, have a more hidden relatable side. We never really learned why the Joker was the way he was in The Dark Knight, but it is given up to our imagination that he had a terrible childhood. Correct me if I’m wrong, but I believe there were three different scenarios the Joker brings up about his childhood that would all be decimating to mental health. We are just too distracted by the rest of what’s going on the realize enough and it’s masked by the pure insanity his presence brings in the film–to me, this is just plain genius. Hating the villain is one the most important things to having a great villain and giving too much of a reason to feel bad for the villain takes away from his presence and everything he does (at least that is my preference when it comes to villains). The way that The Joker’s past was masked up by a bunch of what seemed like plain old stories was a great way to give the watcher reason to sympathize, but it was hidden enough not to take away from the villain. Final Fantasy VI does something equally, if not more awesome with it’s villain Kefka. At the beginning of the game it seems harmless, just a creepy laugh thats almost comical, but just as the surprise of the world being destroy comes out of no where, there is more to his laugh than one would think. Rather than being the harmless, slightly creepy laugh that it is originally thought as, it’s really his way of showing his power over everything. He had a plan the entire time, and he has just the amount of psychopath in him to be as patient as he wants–he’ll spend his time laughing at the heroes well he waits. By the end of the game the laugh just brings back all the hate for what Kefka has done, and you want to do everything you can to shut it up. It goes from being harmless and creepy to downright terrifying. Well I think that’s enough of explaining Kefka for now. Such a great villain needs a great theme don’t you think? Well Kefka sure does. Kefka’s theme does everything it needs to sum up Kefka till his last moments. While the song repeats it self, it’s really just one build up that keeps adding more and more to the original theme. The song goes from making the melody very edgy and almost random sounding to making the melody sound full of evil power. It even comes out as almost a surprise starting with a quiet beginning then intruding with percussion and more complex instrumentation giving it the more powerful feeling JUST like his role as a villain. Just as the player accepts Kefka as just a edgy crazy general that can’t do any real harm he comes out of no where with all this power. It’s like spoilers hidden in the music from the first time Kefka is met keeping us at the edge of our seats till we know what he’ll do next. Side Note: Notice how Kefka and the Joker are really similar? Notice how Locke is one of the main protagonists and similar to Batman? Told you he’s the Batman.